← Kuch meetha ho jaaye? 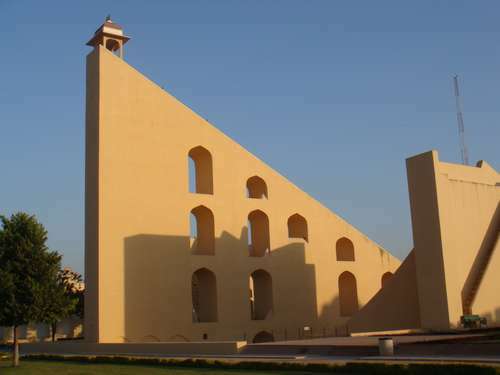 Jantar Mantar- an astronomical marvel! 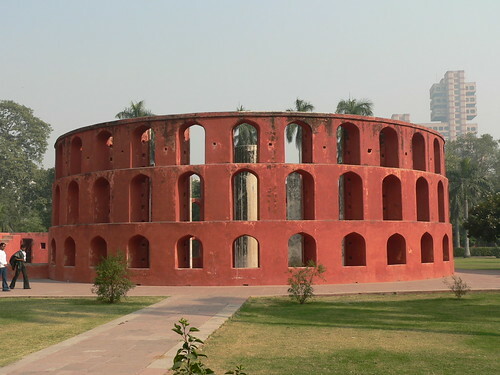 Ever wondered why Jantar-Mantar is named so? Jantar means “instrument”, and Mantar means “formula”, or in this context- “calculation”. Therefore Jantar-Mantar means ‘calculation instruments’. These astronomical wonders are age old observatories and have immense scientific significance. 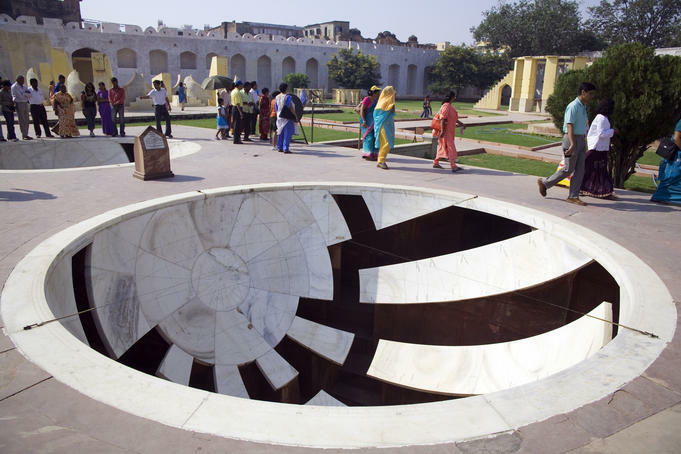 The samrat yantra is a giant sundial which can be used to tell the time to an accuracy of about two seconds in Jaipur local time. It is the world’s largest sundial, standing 27 meters tall. Its shadow moves visibly at 1 mm per second, or roughly a hand’s breadth (6 cm) every minute. The gnomon is ninety feet high and has niches in to wall so that storms do not affect the instrument. The gnomon is right angled wall and the hypotenuse has steps to climb up. The hypotenuse has also a scale to find out the altitude of the sun. The hypotenuse points towards the pole. On either side of the pole is masonary quadrant. the centres of which lie on the edge of gnomon. The edge of quadrants are graduated in hours, minutes and seconds. In this scale one minute has been divided to the extent of 30 parts, this way it is accurate up to 2 seconds. It is the most accurate, interesting, and educative among all the instruments of observatory. It will not be extravagant to say that this was an instrument which was built at last, so that he could verify the readings and calculations of other instruments. They were rectified with the help of it. The instrument is nothing but the cavity divided into two parts, each one complimentary to other. The cavity is nothing but the upside down of the earth. It has been divided into two parts, so that the measurer could go inside and calculate the readings accurately. The foundation has lead sheetings so that the various seasons donot affect the readings. Each of these two cavities are divided into six marble slabs, divided further into minutes and seconds. They are also bearing the inscriptions of twelve symbols of zodiac. In the middle of the instrument a ring is hanging with the help of the wires. It is an ideal instrument for demonstrating the the so called “doctrine of sphere” and showing to the eye, the apparent motions of the Sun, and would be great educational value to all commencing the study of astronomy. The marble slabs are alos introduced for the zodiac sysmbols. It is a rectangular board with a slit and a set of pointers with concentric graduated circles. Adjusting the slit, time and other calculations can be obtained with the help of pointers. Its back side was made as a quadrant with a plumb and an index arm. Thirty parallel lines were drawn inside the quadrant, and trigonometric calculations are done graphically. After determining the sun’s altitude with the help of the plumb, time was calculated graphically with the help of the index arm. This entry was posted in Culture, Technology, Travel. Bookmark the permalink.